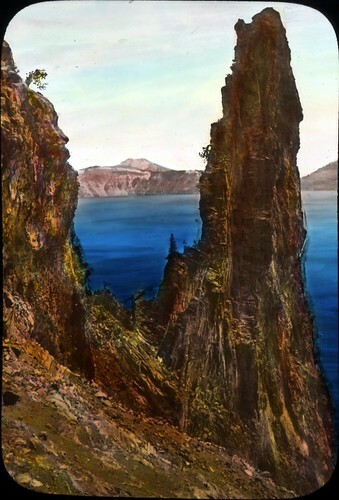 Still reeling over those delightful Crater Lake images in Flickr Commons? Want to know more about the man who took them? It’s another great story and another great find — from the comfort of our own offices… And the pages in Oregon Photographers: Biographical History and Directory. It turns out that many (maybe all) of these images were taken by a Portland-based photographer who was “one of the best known commercial view photographers in the era between the turn of the century and the first world war.” No, he’s not one of the Giffords, but a man named Frederick H. Kiser. Kiser partnered with his brother, Oscar, to set up the Kiser Scenic Photo Studio in Warrendale (1903) and Portland (1905), and they produced both images and murals. They grew up on Columbia Beach, on the Columbia River opposite Beacon Rock — a place, of course, known for its beauty and undoubtedly its inspiration! Their parents owned the Columbia Beach Hotel and Nursery. Unfortunately, Oscar died in a boating accident soon after the business was established.He is buried in Lone Fir cemetery in Portland. Curious about Fred? He was a longtime member of the Mazamas, a mountain climbing club that is based in the Portland area. He was a frequent contributor of photographs to their publications. In 1915, he sold the business so he could devote his time to photographing the new Columbia River Highway and in 1922 he opened a motion picture studio! Fun fact: Gifford was also based in the Columbia River Gorge area for a time, with studios in the Dalles. This entry was posted in Flickr Commons, Main Page, Visual Instruction Department, Visual Instruction Slide on August 26, 2009 by edmunsot.